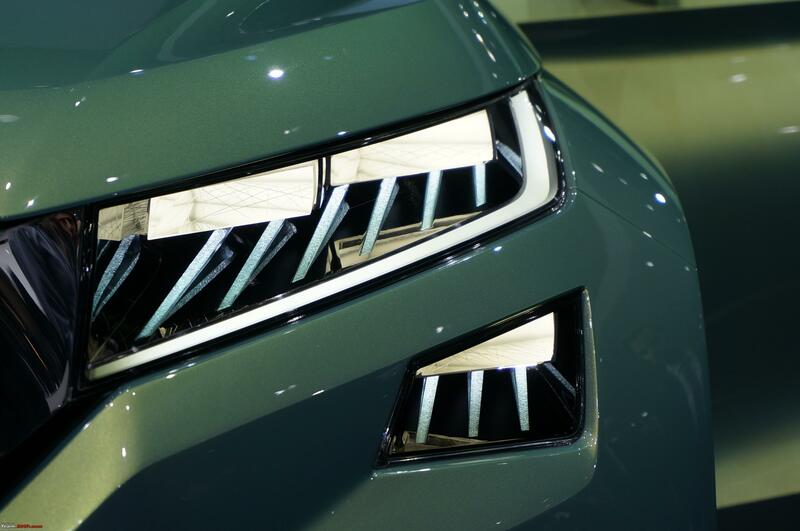 Mod Note: Our Kodiaq Report has been taken live at this link (Skoda Kodiaq : Official Review). Please continue the discussion over on the new thread. Thanks! 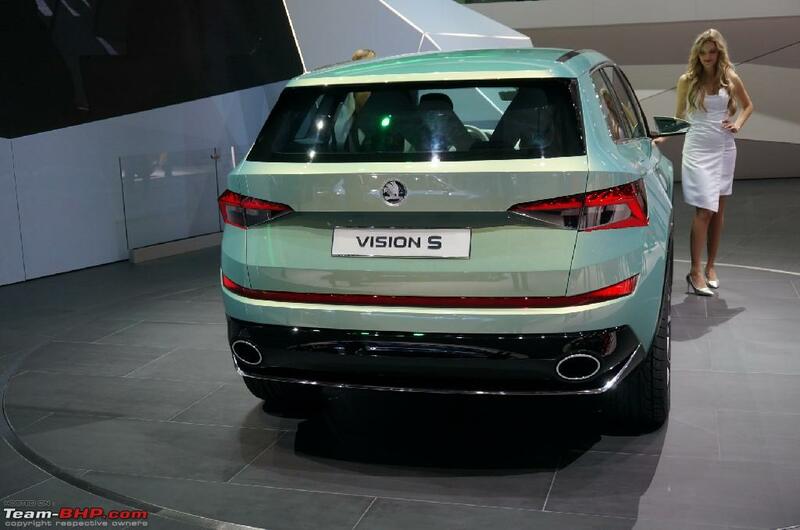 The VisionS Concept was revealed at the 2016 Geneva Motor Show & formed the base for the forthcoming Kodiaq SUV. 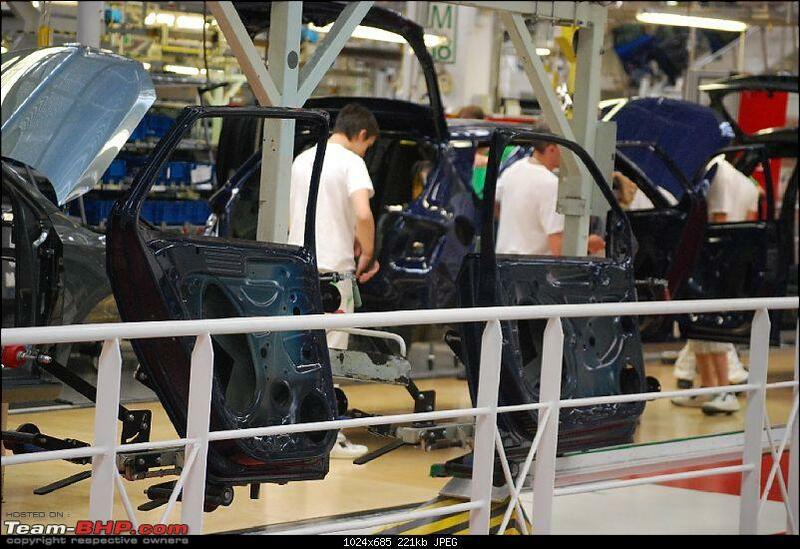 The management of Skoda had mentioned that the model was nearer to production than you would think. 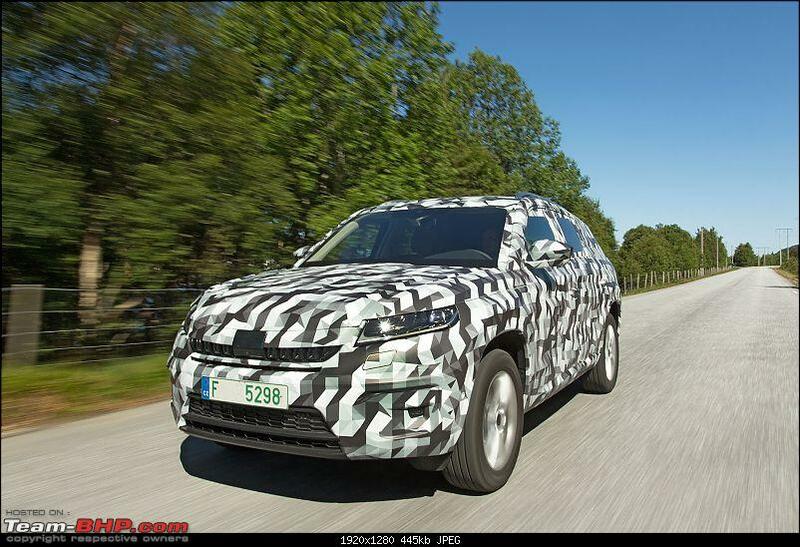 Now, it has been confirmed that the Kodiaq will be revealed at the forthcoming Paris Motor Show. Pilot production will commence in October 2016 with an eye on an early 2017 market launch. 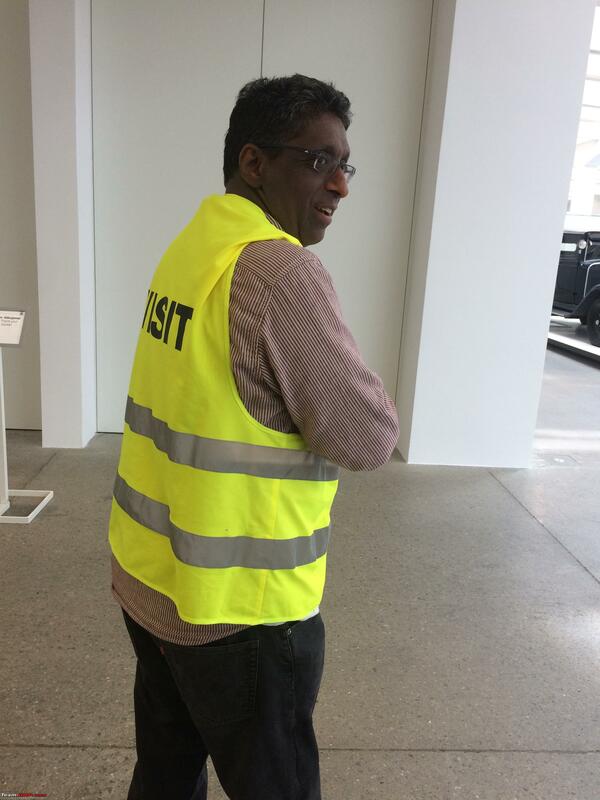 Team-BHP was invited to participate in a preview of the car prior to the actual Paris reveal. No photography was permitted. We had to surrender both, our cameras and phones, before entering the hall. A lot was discussed, but minimal data was supplied in the press material. Hence, you will need to rely on my far-from-eidetic memory for most points. 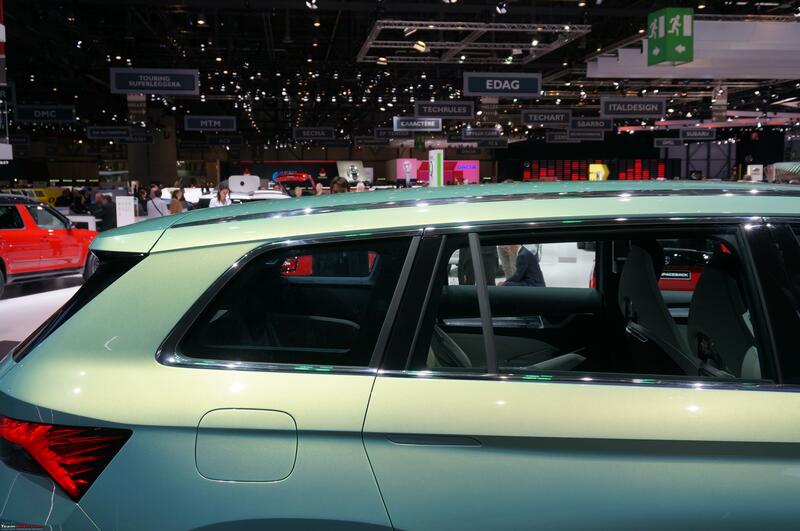 The Kodiaq is a part of Skoda's Strategy 2025. 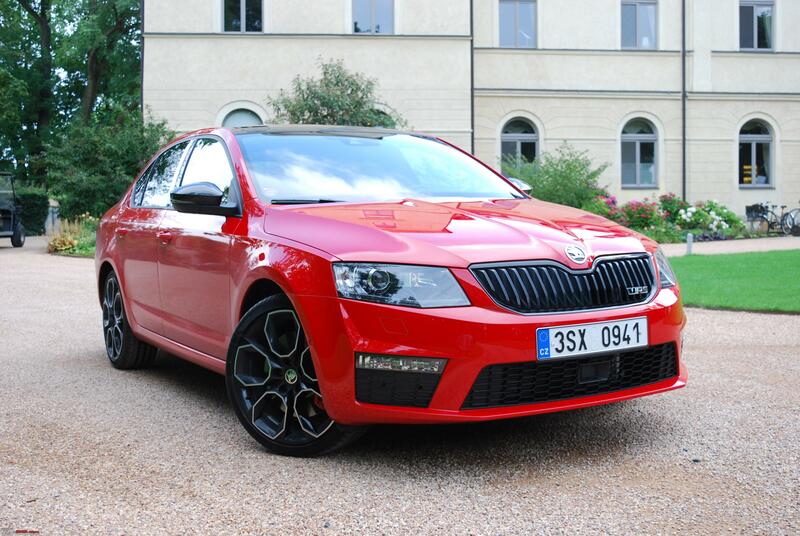 At present, Skoda offers six different models – CitiGo, Fabia, Rapid, Octavia, Superb and Yeti. These six models have 40 variants in terms of body styles and engines. 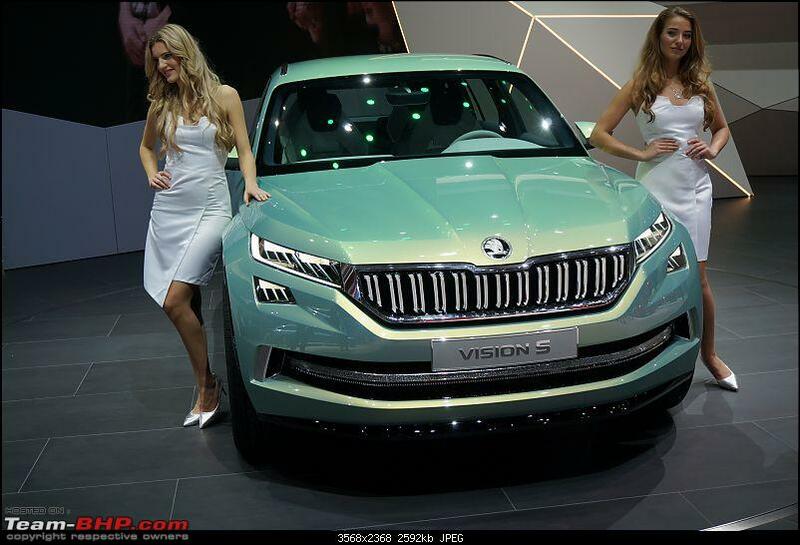 High hopes are placed in the Kodiaq as it is slated to improve margins tremendously. 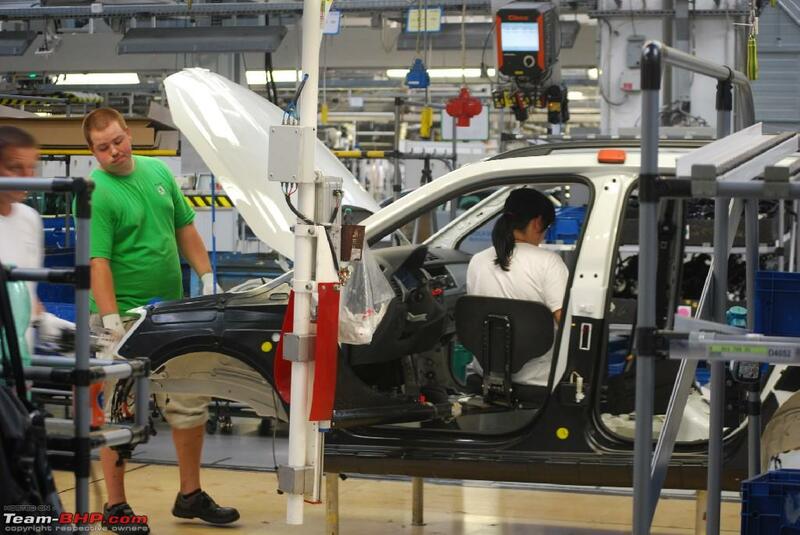 It enters a 4.7 million strong growth market for SUVs. The Yeti has been well received (internationally, not in India where it's a flop) and accounts for 10% of Skoda's sales. 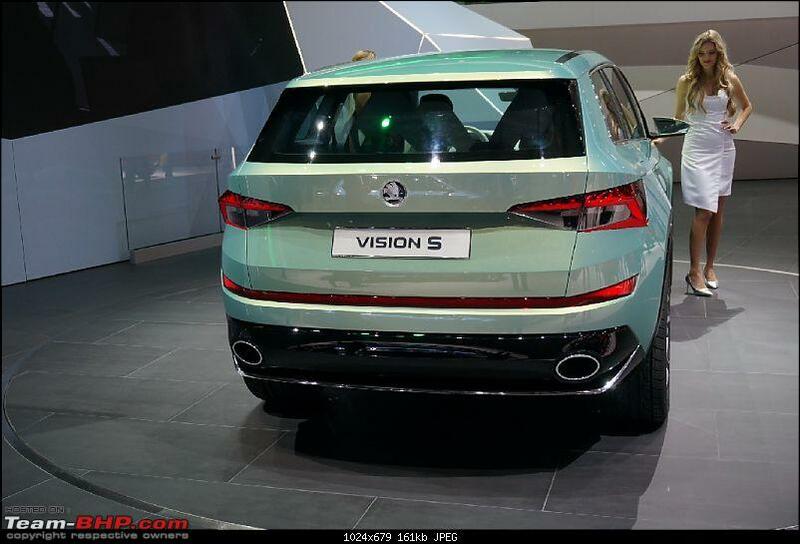 This takes Skoda into the large SUV segment. 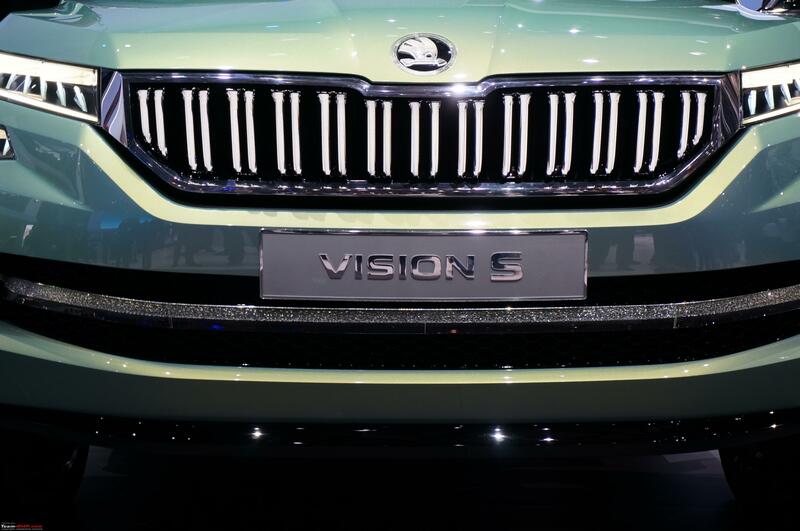 They have high hopes in China, where owning an SUV projects presence and freedom. 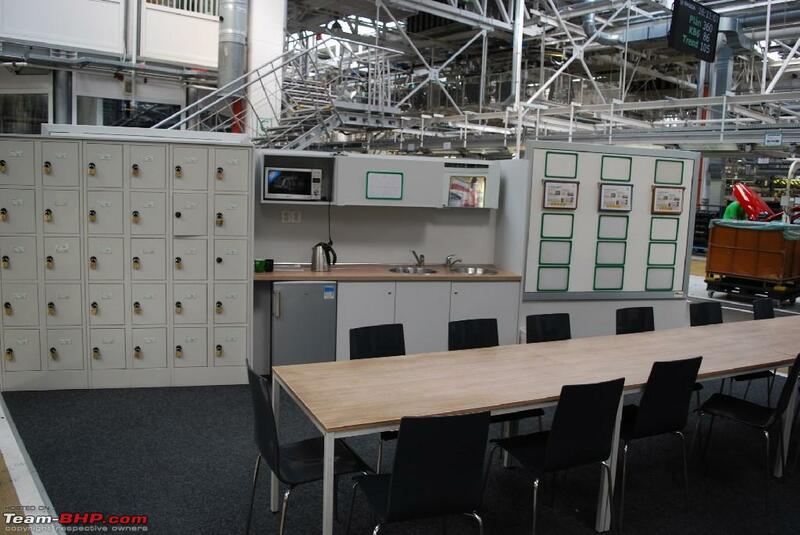 Skoda claims its USPs are superior space, safety and value (in terms of interior equipment). Sounds familiar? 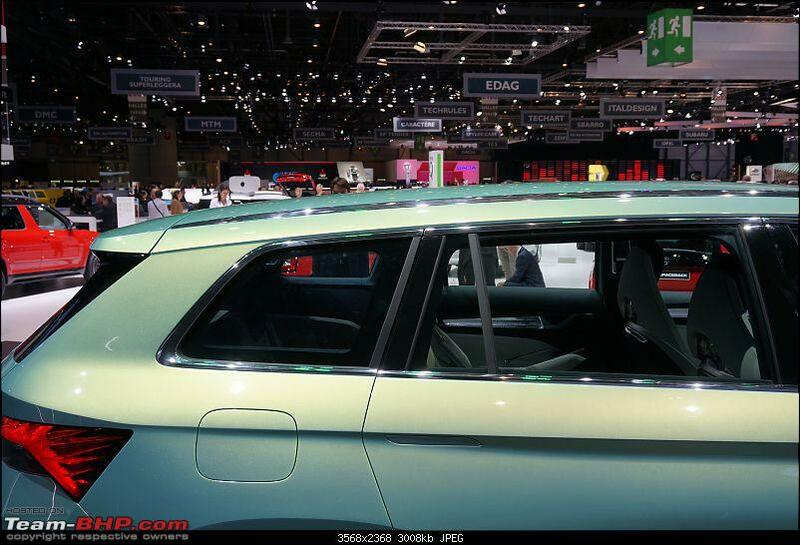 Yep, it's the 'Skoda Superb' formula with an SUV body style. If priced well, it can lick all the 40 lakh SUVs. Can be a game-changer just like the Superb was. 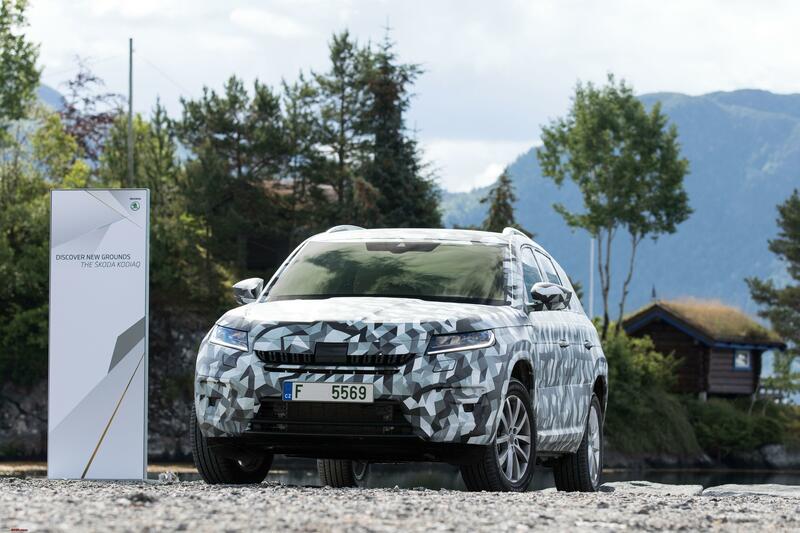 The Kodiaq sits in between traditional model segments to offer more car compared to other rivals. 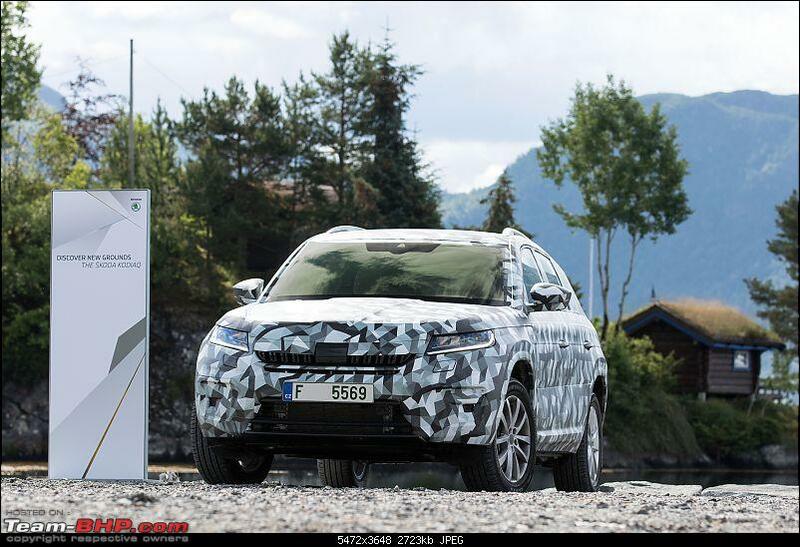 After this overview, the Kodiaq was revealed to us. Before I provide my observations, let's have a look at the car's dimensions. It has presence, despite being only 4 cm longer than the Octavia. The Kodiaq has the largest boot in its segment at over 2,000 litres with the seats folded down. 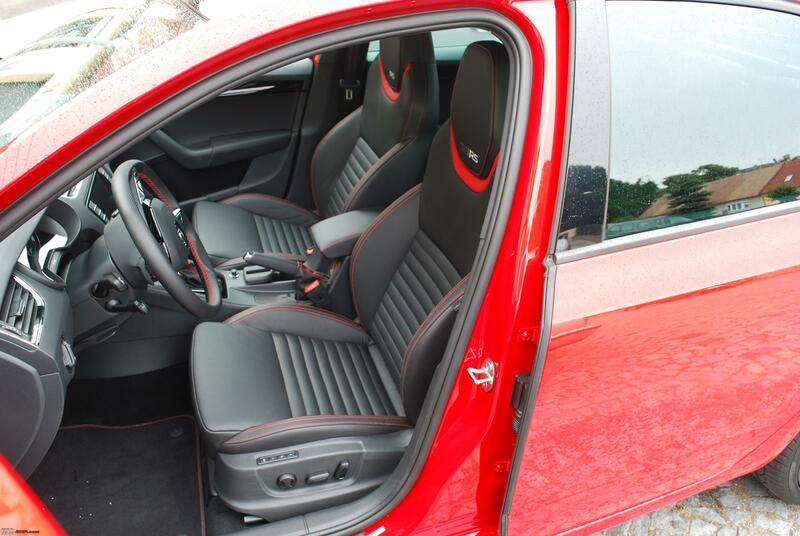 With all 7 seats up, the Kodiaq has slightly more boot space compared to a Fabia. It is similar to an Innova Crysta, but a lot more than an XUV500. 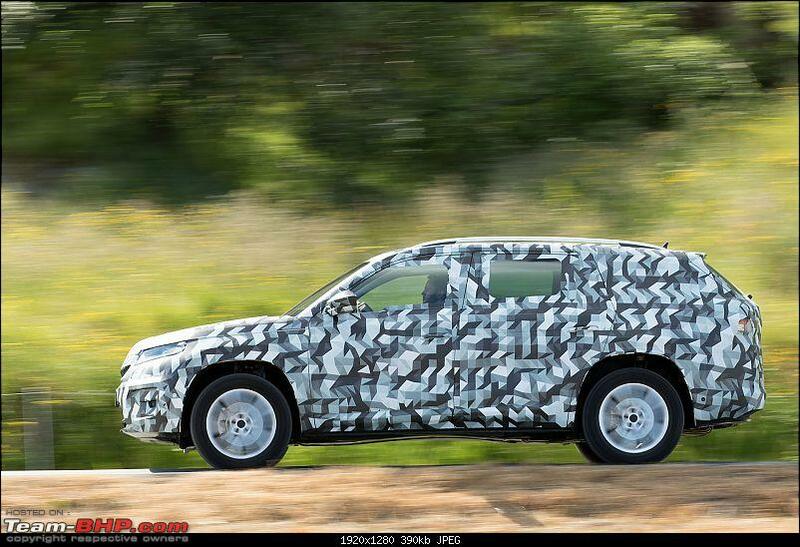 Note: Images of Skoda Kodiaq test mules provided by Skoda. So, what happened to the beloved 1.8 TSI? 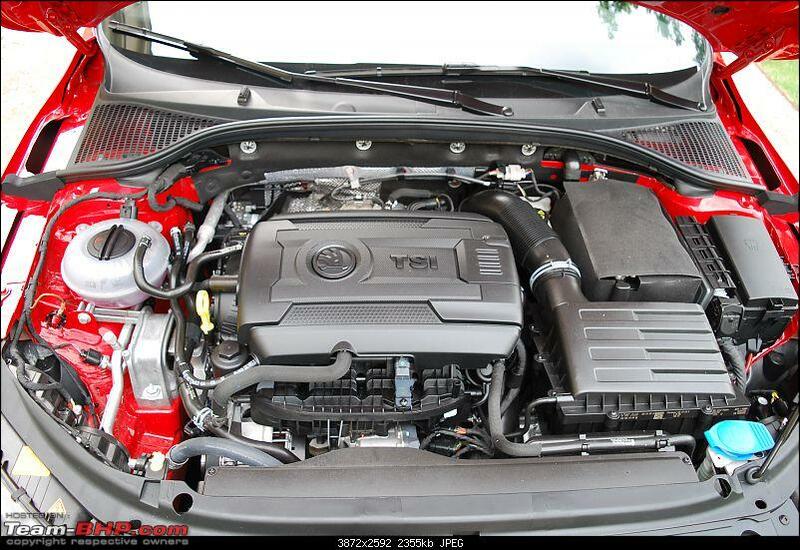 Well, that has been withdrawn and replaced by the 2.0 TSI with a revised combustion chamber for better emissions. Another reason is the 1.4 TSI 155 PS coming closer to the 1.8. My speculation is that we might get a 1.4 TSI for the volume price point as well as the 2.0 TSI and 2.0 TDI on higher variants. The version we saw was a diesel complete with an AdBlue system. No hybrid has been planned for now. We were not allowed to look under the bonnet as it was a pre-production "mess". The 4x4 system is a hydraulic, multiplate inter-axle system. Yes, it is Haldex, but now BorgWarner has acquired Haldex, so the name is no longer used. 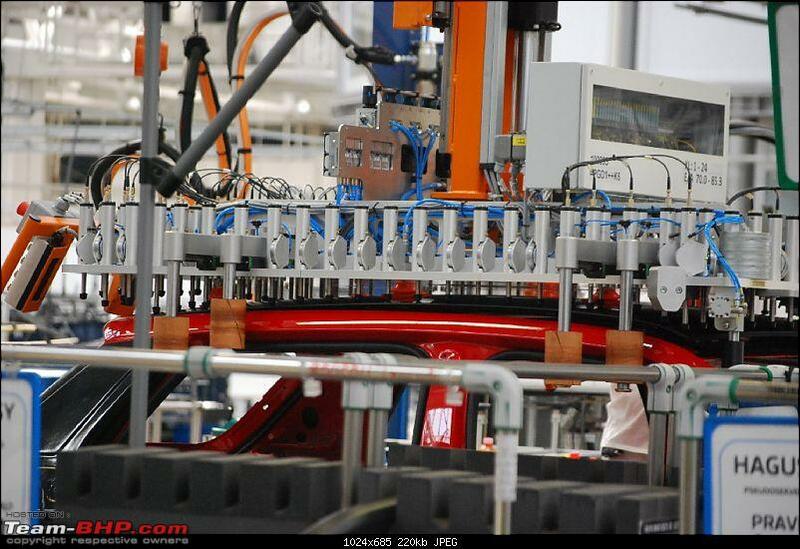 The chassis will come in 2 variants - Conventional and Dynamic Chassis Control (DCC) with Comfort, Sport & Normal modes. In simpler terms, one will be a stock suspension, the other will have adjustable dampers. The driving modes will be Eco, Comfort (DCC), Normal (DCC), Sport (DCC) as well as Individual - the steering, suspension and throttle responses are configured to your taste. There is also a Snow mode which dumbs down throttle response and restricts gear ratios. The Kodiaq has a strong road bias, with the 4x4 mode being only for mildly rough patches. No, this isn't a rock climber like a Land Rover. It comes with a ground clearance of 190 mm and a wading depth of 300 mm. The car's approach angle is 22 degrees, ramp angle is 19.7 degrees and exit angle is 23.1 degrees. 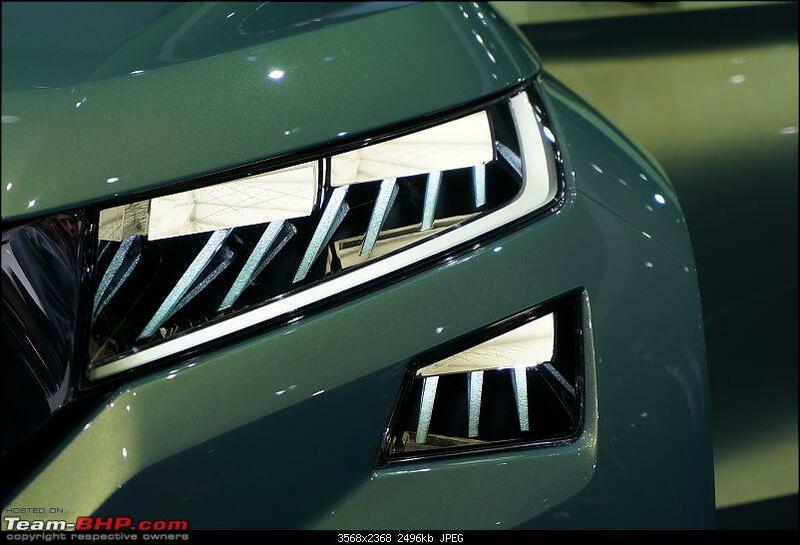 The Kodiaq comes with some new, simple (the "why the hell did I not think of that") ideas. Detachable, magnetic boot light which doubles up as a torch. This can be mounted on the bonnet, over the wheel arch, etc. 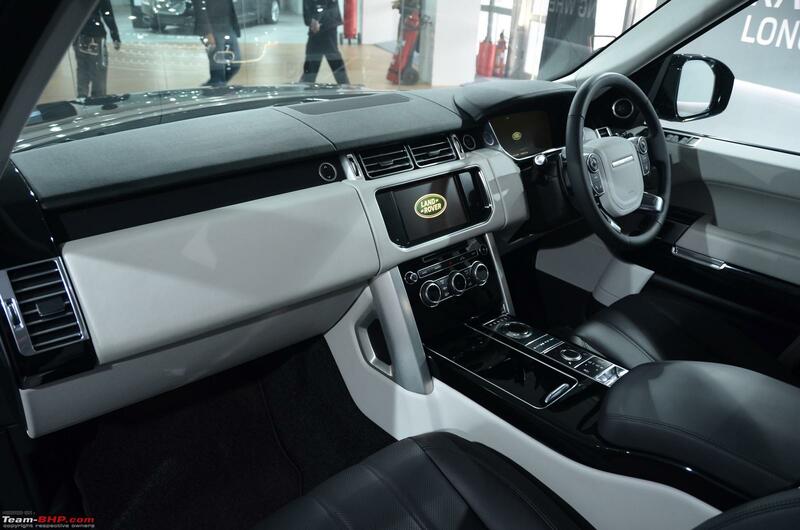 Driver's microphone picks up driver's voice and broadcasts that to the rear speakers – no need to shout at your kids. I am not sure what happens when you whisper sweet nothings to your wife though ! Last edited by Aditya : 4th August 2016 at 22:15. The Kodiaq is a proper Skoda. 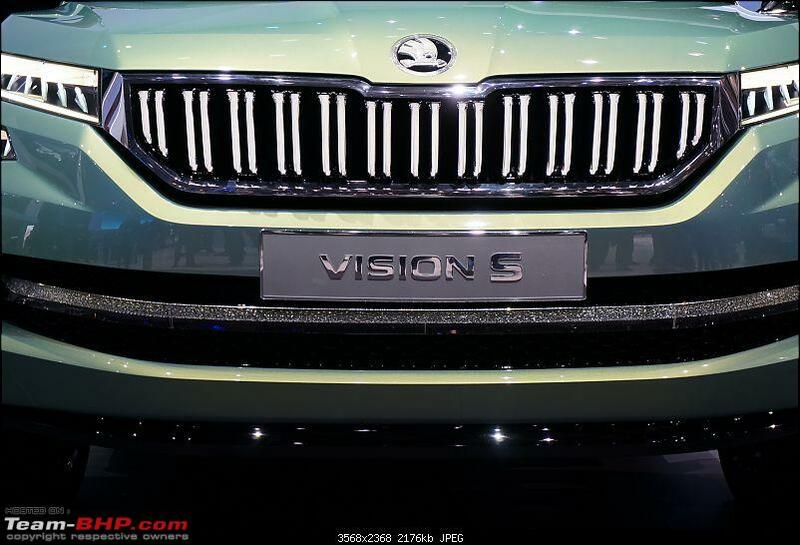 Imagine the VisionS concept with elements of the Superb grafted on it, and you get the picture. 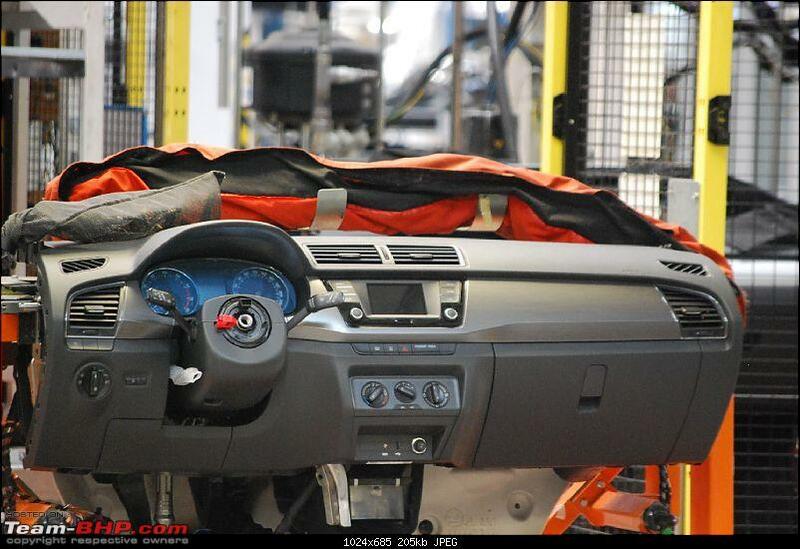 It has some elements of the Tiguan, but the detailing sets it apart (the spy shots of the recently revealed Tiguan XL point to a possibly shared floorpan). 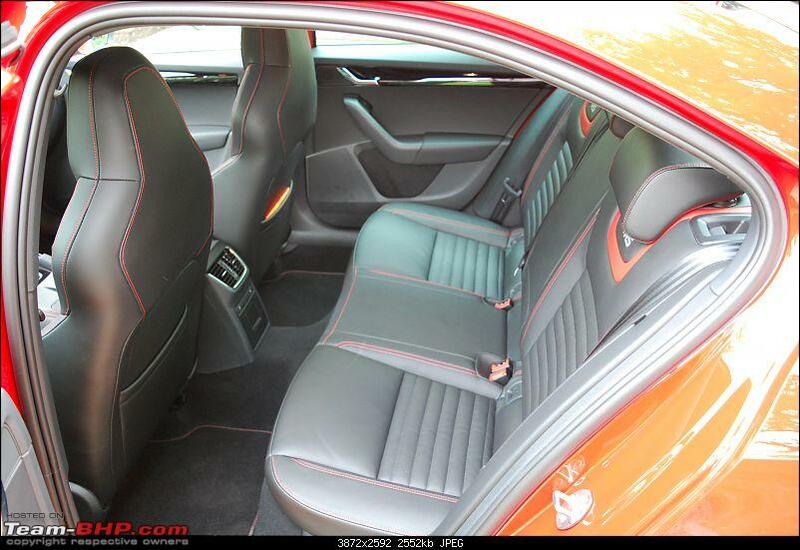 You can tell that some Audi design elements exist, but these are very subtle. You are in no doubt that this is the Superb's beefier, taller brother. 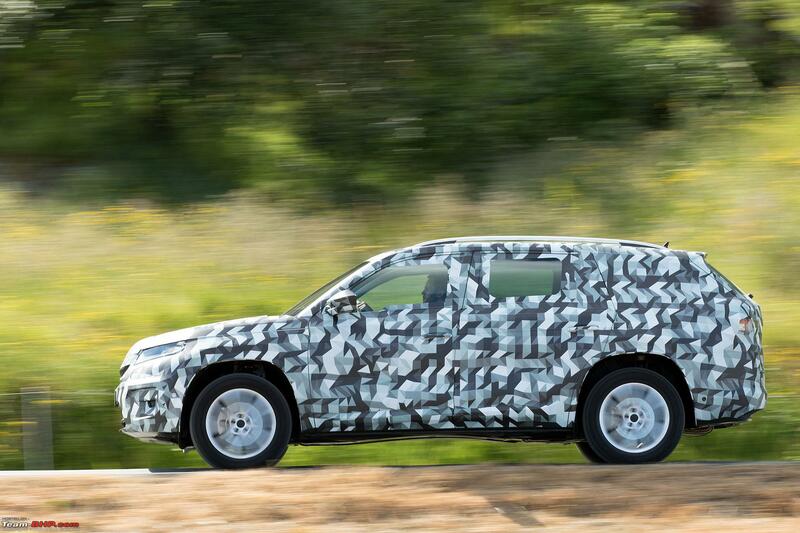 The disguised prototypes make the Kodiaq to be perceived as frumpy. This is not the case in reality. All I can say is that Auto Bild's artist impressions are pretty close. Initial versions will be Ambition and Active. Expect Scout and Sport versions later on. L&K variant is yet to be decided on. "MQB has been a gift to us, since we can develop new variants quickly and it gives us the flexibility in production"
"Design for function, function for design"
Last edited by Aditya : 4th August 2016 at 22:16. Like Maruti dominates the automotive scene in India, Skoda dominates the car market in the Czech Republic & neighbouring countries. 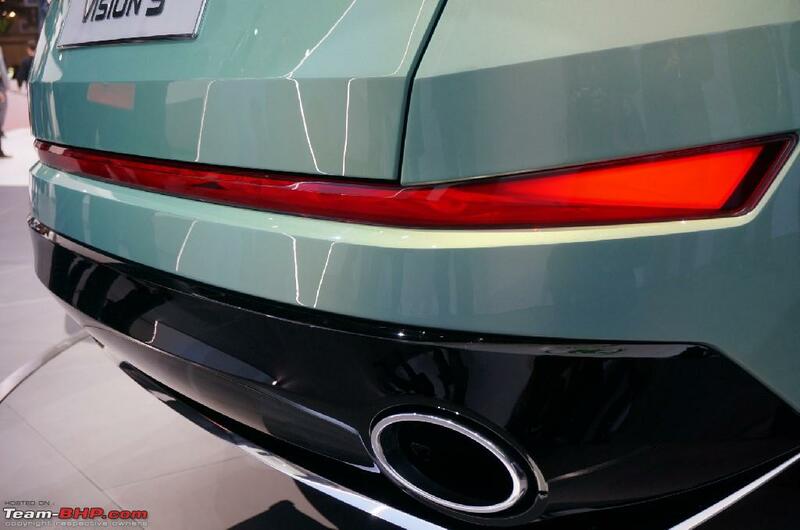 There is very little reason to look outside the model range, unless you want something more exciting or exclusive. One finds relatively fewer Mercs, BMWs and not too many Audis. Most of the more fancy brands are in plenty in Prague (like in most capital cities). 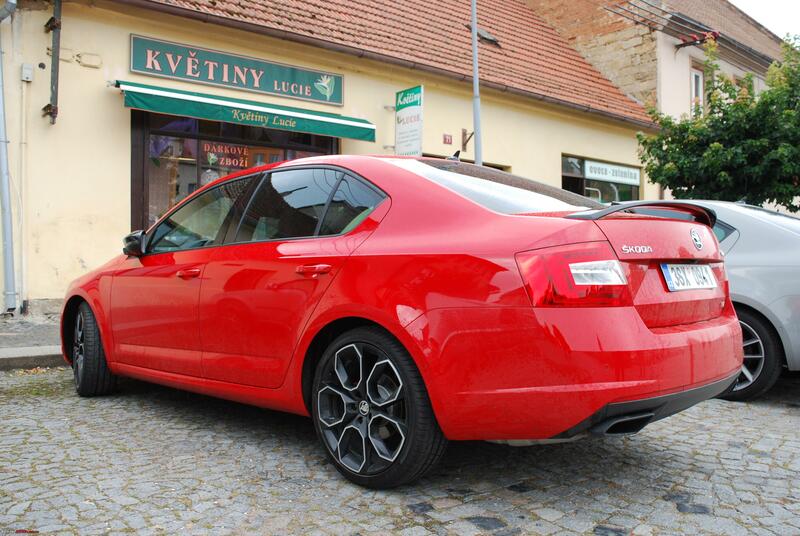 The Czech countryside has mainly Skodas, with the odd French or Japanese car. 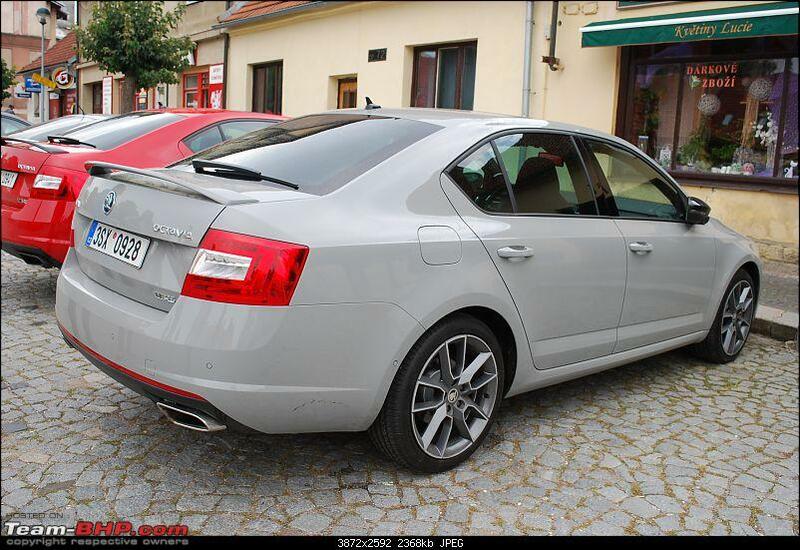 One sees a lot of older 1990s cars which came in before the Octavia was introduced. Except at the Skoda museum (separate report coming up later), we never saw any older rear-engined Skodas on the road. We did see plenty of clapped out Felicias though. I was back in the country after a gap of 25 years. Back then, it used to be only Skoda Estelles with the odd VW Golf / Jetta / Passat and quite a few Mercedes W124s. Mladá Boleslav has two final assembly halls. 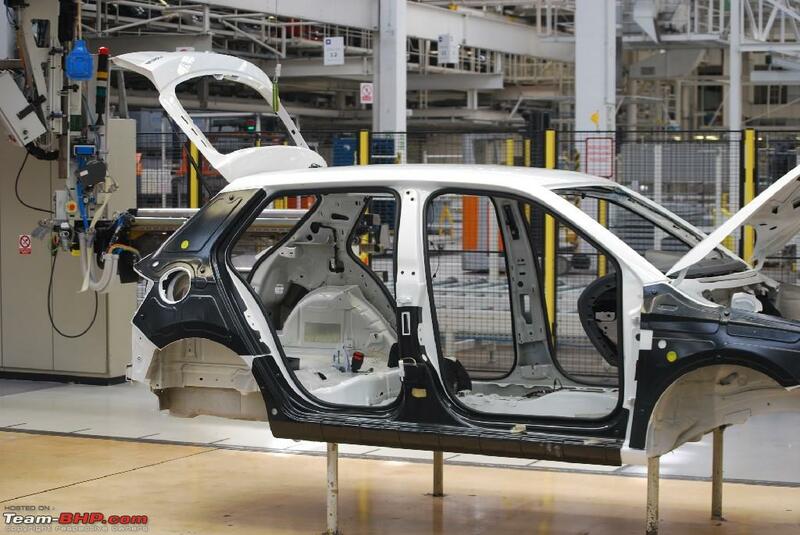 One assembles the Fabia and Rapid, the other assembles the Octavia. 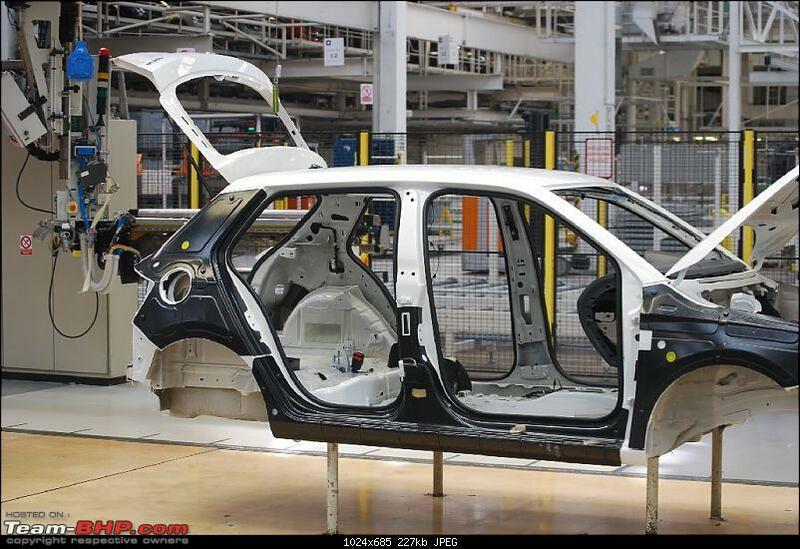 As a new facelifted Octavia is undergoing pilot production, visitors were not permitted inside. 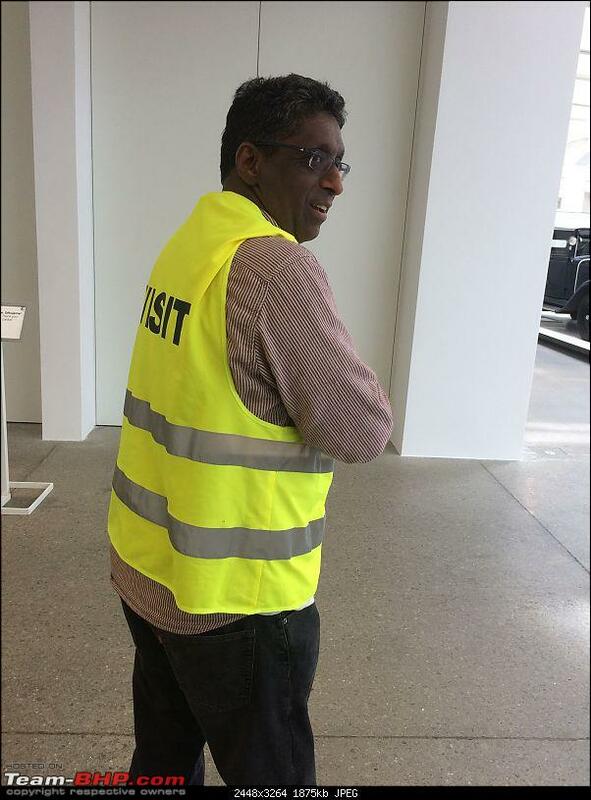 All of us had to don bright yellow vests and eye protection. That's me jet lagged after an 11 hour flight and a 3 hour walkabout in Prague! 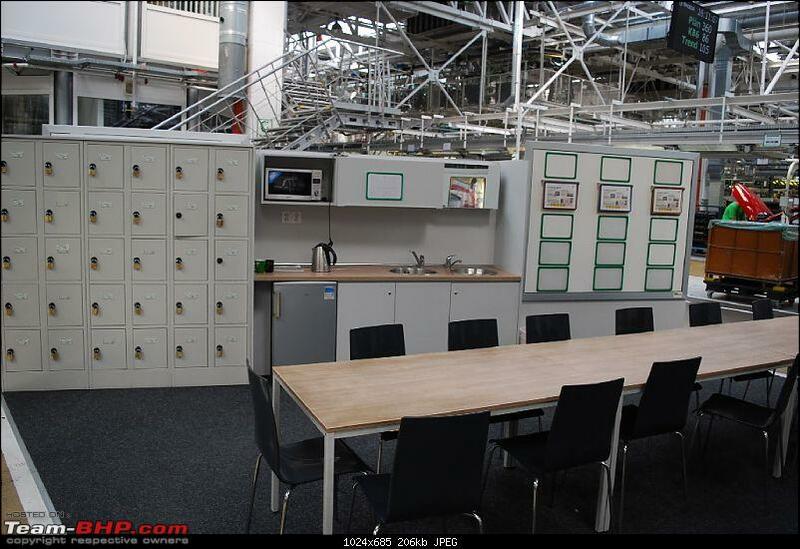 The factory is located about 70 km from Prague. Mladá Boleslav has a population of merely 40,000 people. 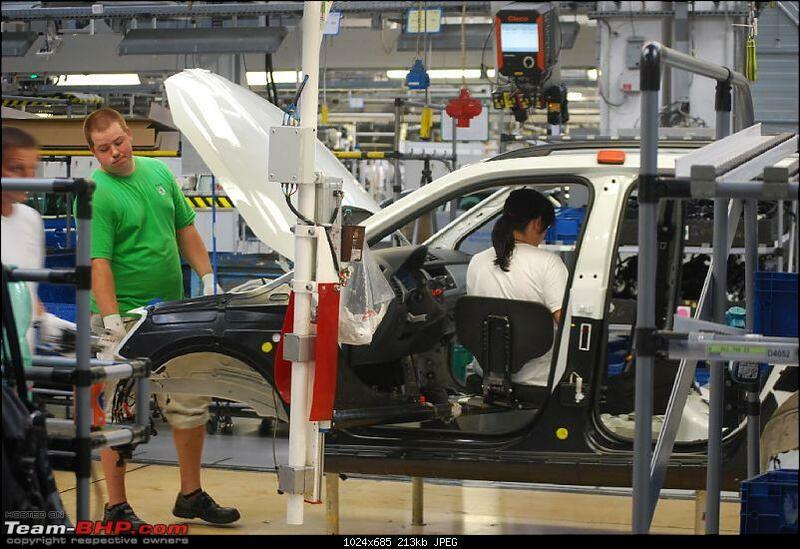 25,000 of them are employed by Skoda (they get a 10% discount on Skoda cars or very attractive lease plans). Their pay is competitive, although rising property prices are a major challenge (don't we know it?) for them. Everything is fine tuned - each specific variant gets the right component at the right time, in the right colour. 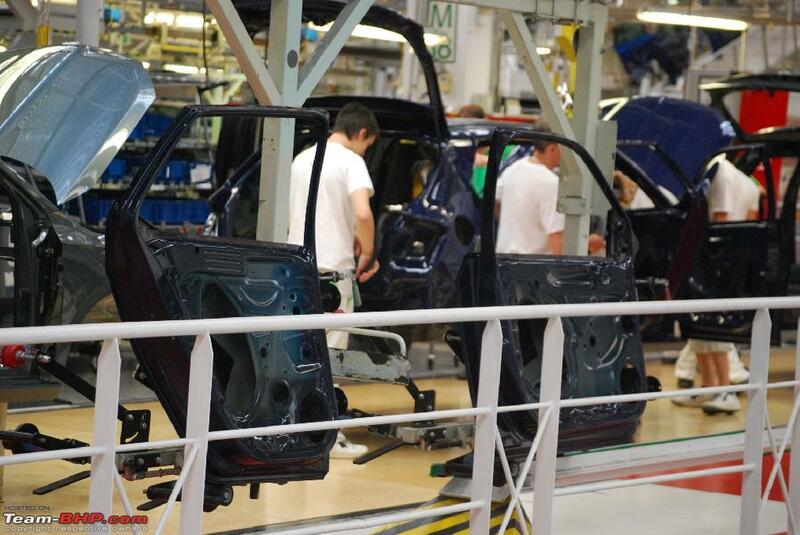 Each vehicle has an individual spec sheet which is stamped by each worker at every stage. This helps trace faults to an individual level. 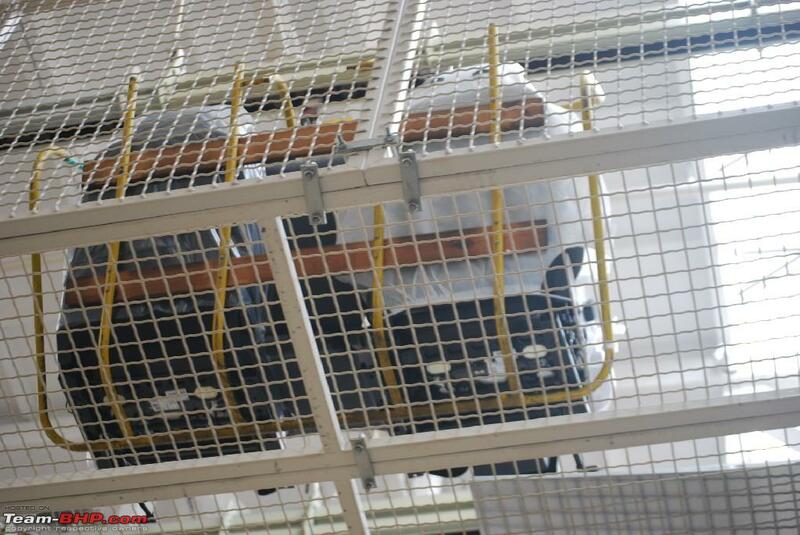 Once the interior is fitted, the powertrain is mounted onto the chassis. 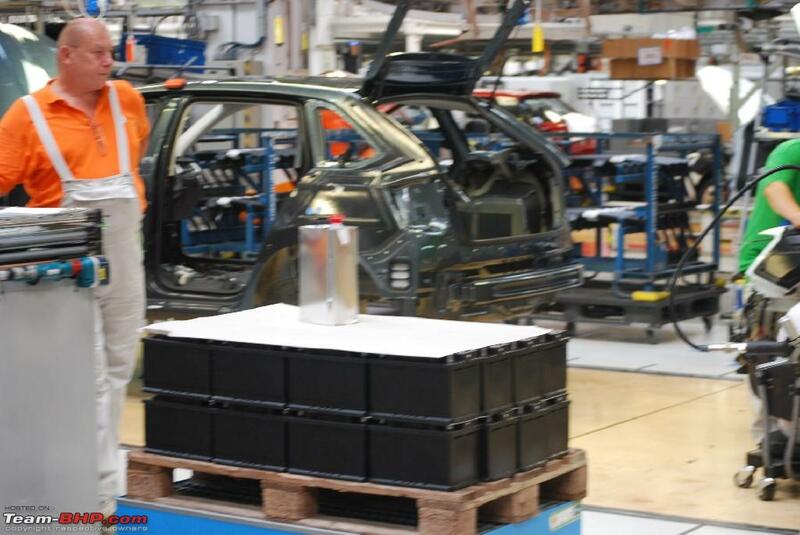 The cars are lifted to the top level for various quality checks before dispatch. Unfortunately, as our movements were limited, there are no further pictures. 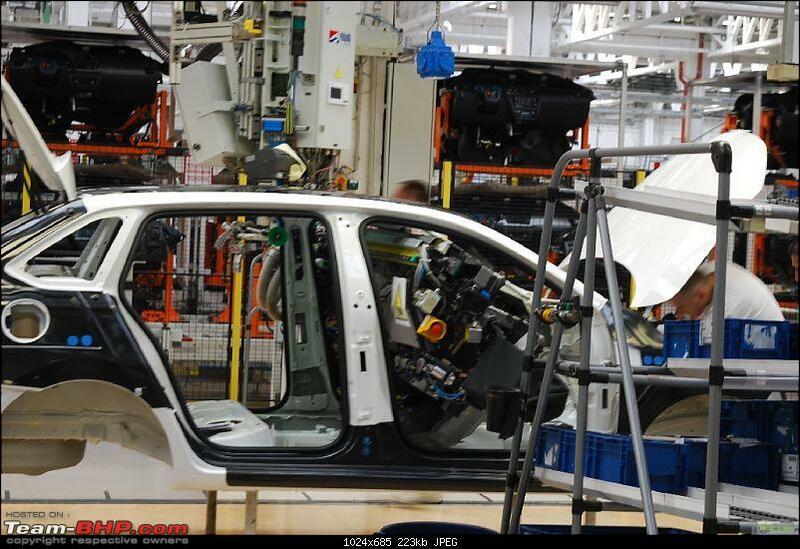 How do Skoda prepare the CKD / SKD units for export? Do they pick and make kits? No. 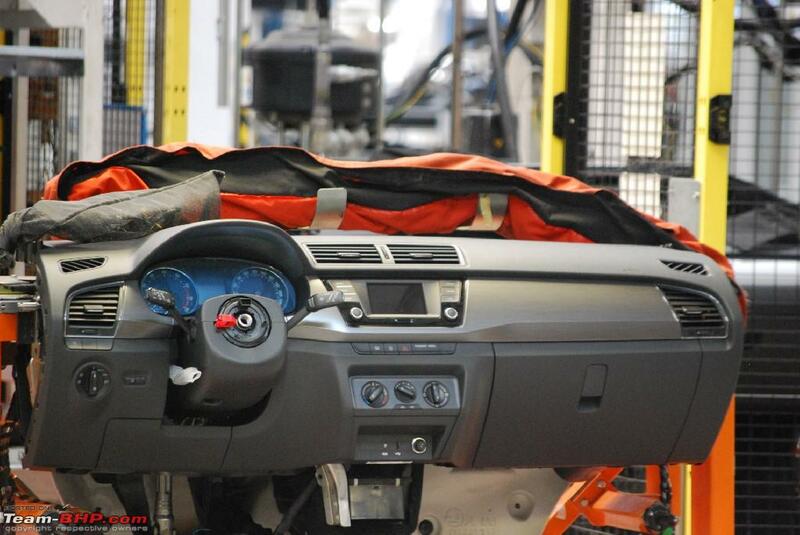 The car is built, then dismantled and crated! Last edited by Aditya : 4th August 2016 at 22:17. Good news - We could sample the traction control!! While getting familiar with both, the roads and the car, we nursed her out of Mladá Boleslav and onto the motorway. It accelerated seamlessly to 120 km/h (speed limit). 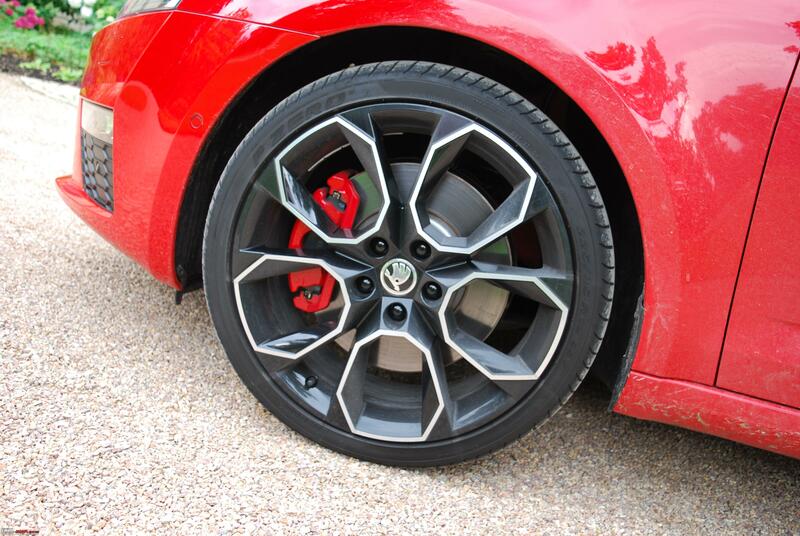 The car was rock stable - you cannot expect anything less from a vRS. As we exited the motorway, I started pushing the car confidently and underestimated the turn-in, which was sharper than expected. I lifted off the throttle, yet the neutral stance of the vRS and a hint of understeer kept it in check. The rear stuck to the road. Moving onto country roads, the suspension was firm, but far from annoying despite the 19" wheels. Czech country roads equate to our national highways, I need not say more. We did go on some rural roads and some bump-thump was experienced, although none of that was a deal breaker. 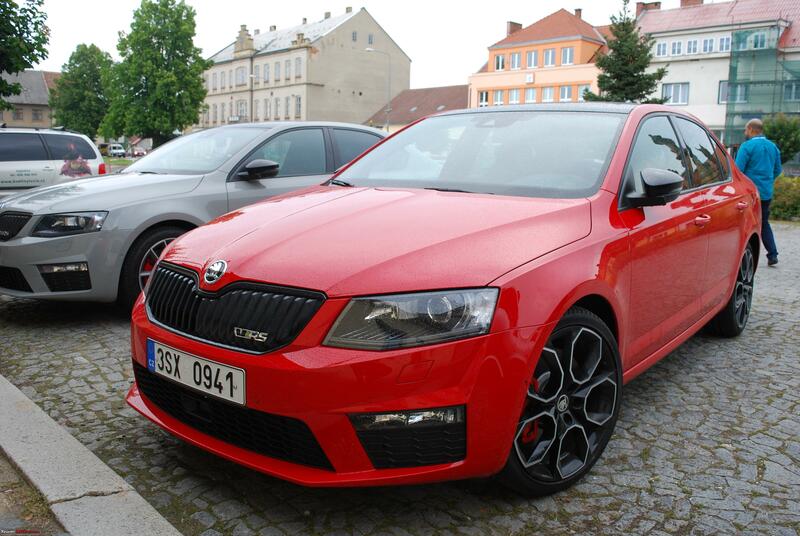 The vRS is a fast family car. It does roll slightly while cornering hard. Anything stiffer would make the ride uncompromising. The steering dispatched fast bends accurately, although it was lacking in feedback. The turn-in is neutral as opposed to being enthusiastic. It does not beg you or challenge you, it merely undertakes the task. The engine is very linear in delivery and there is very little lag. Frankly, my beloved cantankerous Octavia vRS Mk1 was more fun, as you could feel the power kicking in (the turbo whoooosh). 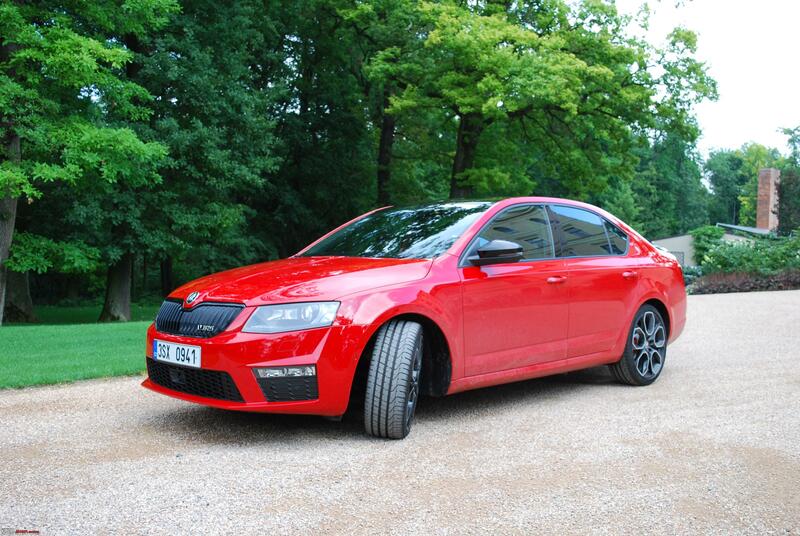 The vRS' engine note at low speeds sounds rather flat. It gets raspy at higher speeds. What is enjoyable is how the engine crackles and pops between gear changes like a hot-rod. 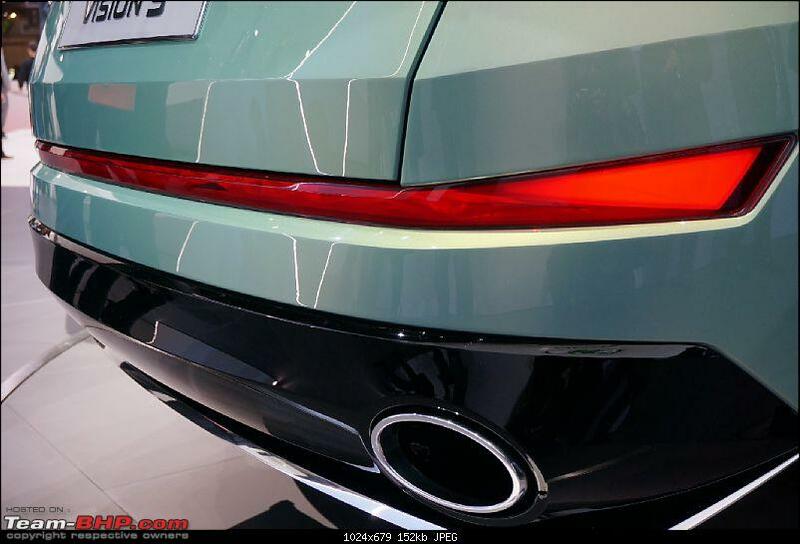 I am not sure whether the noise was artificially piped in through the speakers like the BMWs. Whatever it is, the sound is addictive. Speed limits range from 90-120 km/h. We were passing through different villages, where the limit was 50 km/h. We had a lot of fun accelerating hard out of these zones. The vRS does not feel fast, but my co-driver watching the speedo begged to differ. The snap, crackle and pop became addictive - I was making use of every opportunity to mash down the throttle. The DSG box was eager to shift up, but needed a little prodding to shift down. I then flipped the lever to S and used the paddle shifters. I also pressed the vRS button which made the car more aggressive and much more intuitive to my inputs. My only grouse was the indecisiveness of the DSG when slowing down at junctions and pulling out. The engine almost stalled, since the fuel cut off, assuming we had slowed down. The brakes are effective and bite well; on the flip side, their feel is limited. We unwittingly explored their limits, when we suddenly saw the police flagging us down. The speed peeled away while braking and the car stopped without drama. The next drama was, "why did the police stop us?" It was merely due to the fact that a crate of fish had emptied itself on the road and the police were warning us about the slippery conditions. Never in India would you see something like this! Break over, we resumed our drive and encountered a short rainstorm. Here the vRS excelled. The car puts its power down well and we could make quick progress in the wet. We did trigger the traction control while accelerating hard on some wet roads. Having become familiar and confident, we began pushing the car as hard as was legally possible. It suffices to say that the grey car lost us and got lost in the process. We made it back to the hotel and the sun was out for some parting shots outside the Chateau. The vRS is coming to India. The problem is price and homologation costs. It costs around Rs. 28,00,000 in the UK, implying that it will be in the mid-30 lakh range here. Those 19" wheels will not survive India, as also the fuel quality. 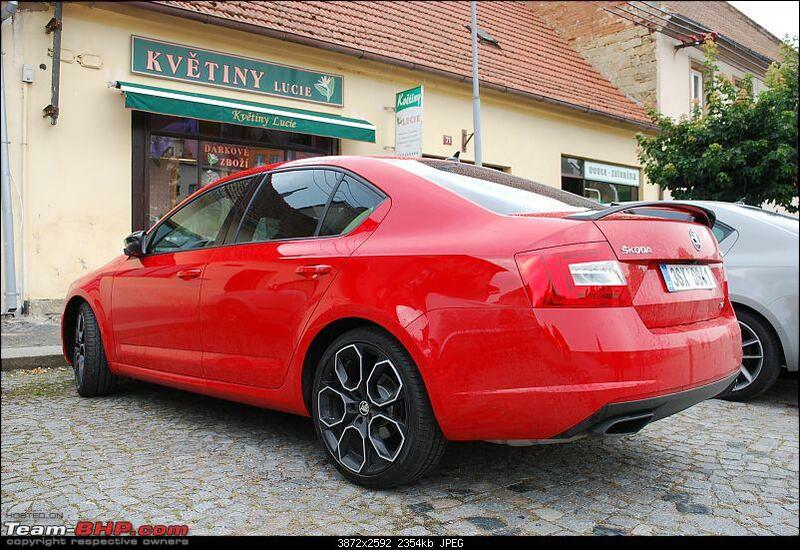 Disclaimer: Skoda invited Team-BHP to the Czech Republic. They covered all the travel expenses for this event. Last edited by Aditya : 4th August 2016 at 22:18. 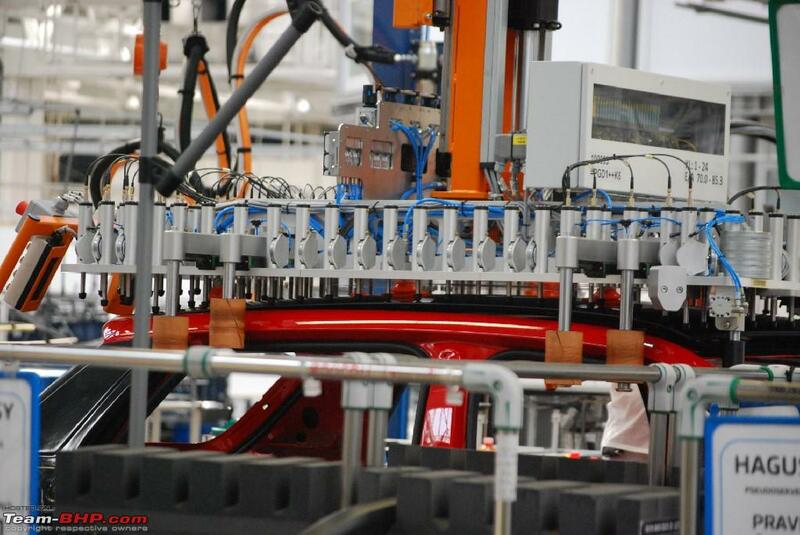 Thread moved from the Assembly Line to the International Automotive Scene. Thanks for sharing! Wow! Good to see Team Bhp being invited to pre production media drives, and a great report as usual. 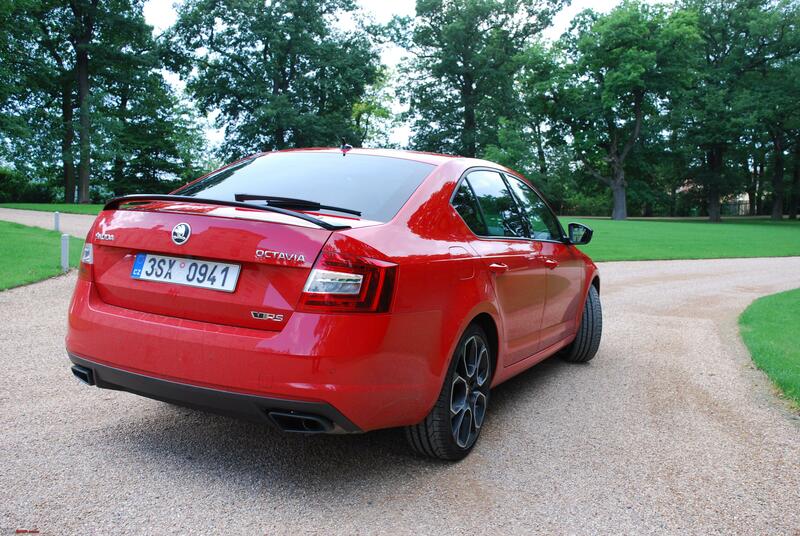 Specially liked the part about the vRS. Both these cars are very relevant for the Indian market since they both are getting launched in 2017. Coming to the Kodiaq, I was initially doubtful about the positioning of this SUV since the sweet spot was right against the Fortuner and that did not leave much space above the Superb. But, with the Innova moving much higher up the range, I believe Fortuner will be a 40L+ OTR car in its new avatar, hence leaving enough room for Skoda to bring in a value proposition like what the Superb did to that segment not so long ago. 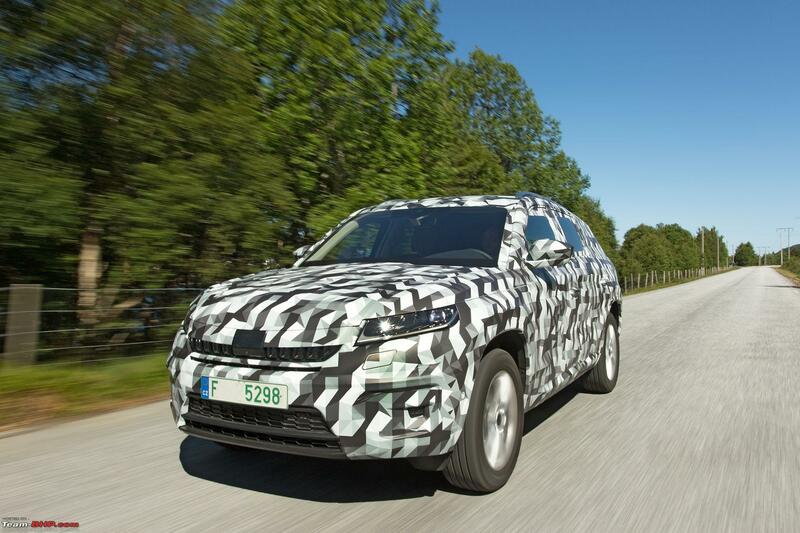 It's mentioned that Autobild's impressions are correct, and if that is the case- we have a very handsome and mature looking SUV in the Kodiaq that should appeal to both the masses and the enthusiasts. Glad that the "Mahindra grin " has been changed to matte black. The stance reminds me a lot of the new Audi Q7, but the reduced length helps it look more like an SUV than the tall estate looks of the flagship Q. In comparison, the new Fortuner is too 'Asian' and bling for my taste, while Endeavor is almost there, but not as elegant as the Kodiaq. I'd reserve my comments on the vRS till the actual Indian specs are confirmed. There is a high chance we will never get the actual version, but only their lookalikes! 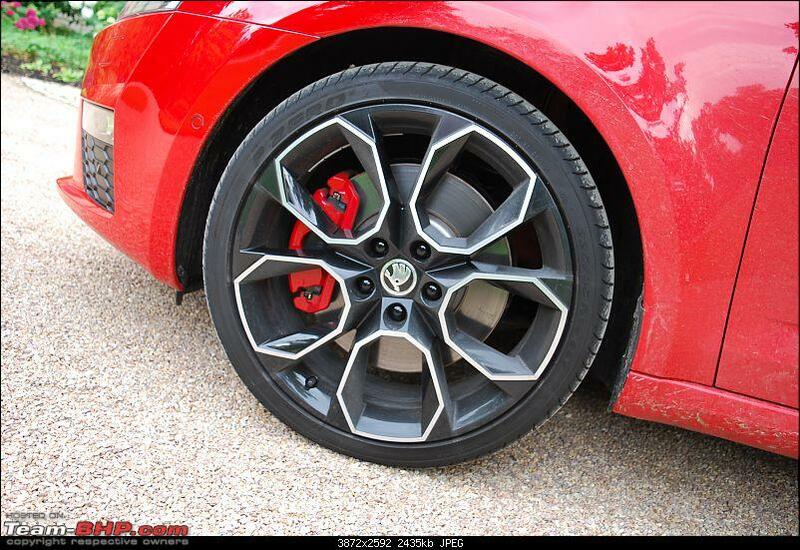 Even if it's a lookalike, I hope we get the more practical and better looking 18inch wheels. The 19ers are an eyesore, and reminds me of a flower (The second time I'm having the same feeling today, but with two different cars. Who designs such wheels on sporty cars!). And talking of the lower variant- I even like the body colored boot spoiler more than the one on the red. PS- Good choice in selecting ajmat for the review as he covered the earlier preview as well and hence made some keen observations about the design that others could have easily missed. Last edited by Zappo : 5th August 2016 at 15:47. Great to read the reviews! Did you see any Yeti's? It has presence, despite being only 4 cm longer than the Octavia. The Kodiaq has the largest boot in its segment at over 2,000 cubic meters with the seats folded down. I guess you meant to say 4 inches longer than the Octavia and has over 2000 cubic centimeters of boot space? As always, enjoyed reading the thread and looking forward to see the product being launched in India! Great report and thanks for providing all those initial impressions. My speculation is that we might get a 1.4 TSI for the volume price point as well as the 2.0 TSI and 2.0 TDI on higher variants. 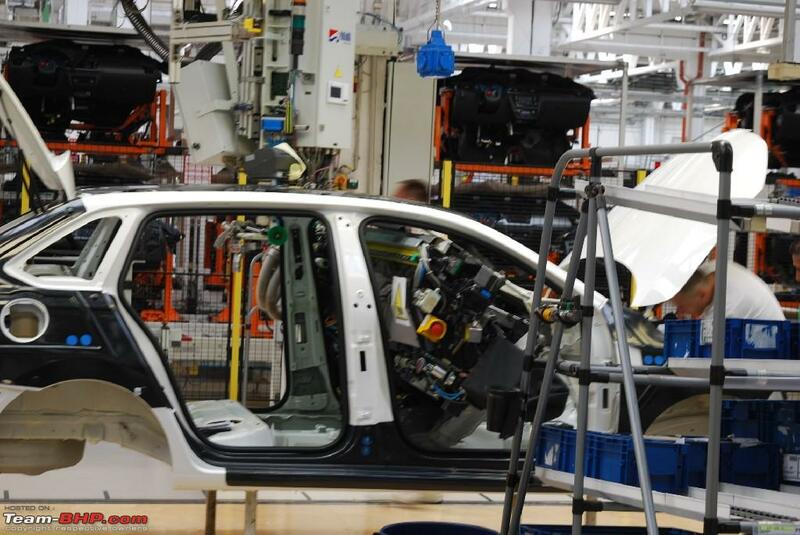 Interesting to note that the 1.8TSI is being replaced - is this with reference to the 3rd gen EA888 motor currently doing duty in cars with the MQB platform (Octavia, Superb etc)?. If that is the case, would that mean cars like Octavia, Superb, A3, Q3, A4, A6 - all will have their current 1.8TSI motors replaced with the 2.0TSI engines? 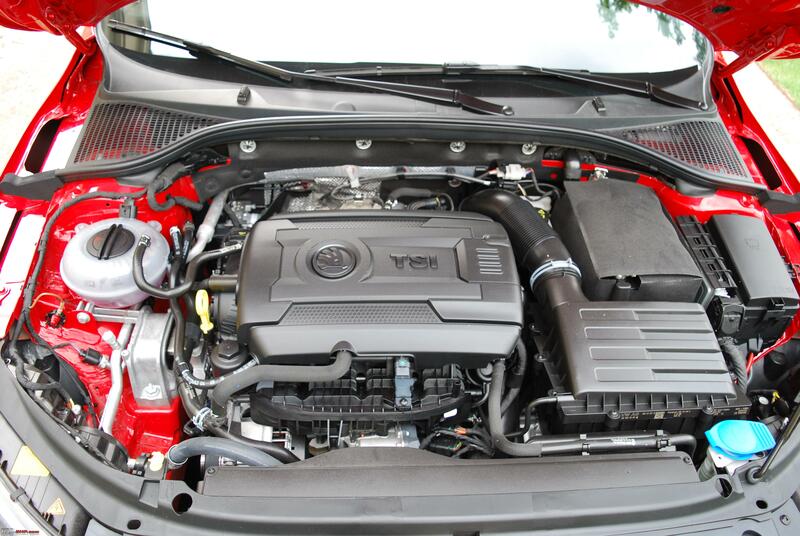 At least for the Indian market, VAG would find it better to use only one engine throughout their CKD lineup, which currently for the petrol variants of the above cars being 1.8 TSI, apart from the 1.4TSI engines used in the entry level models. Homologation costs could then be shared across the models.My wishful thinking is towards the fact the new vRS will have the proper 2.0TSI engine it has abroad and not the watered down version we received earlier. The octagons in the alloys are sticking out and look gaudy. I think they literally forced the "Octavia" on the alloys, just for the sake of it. 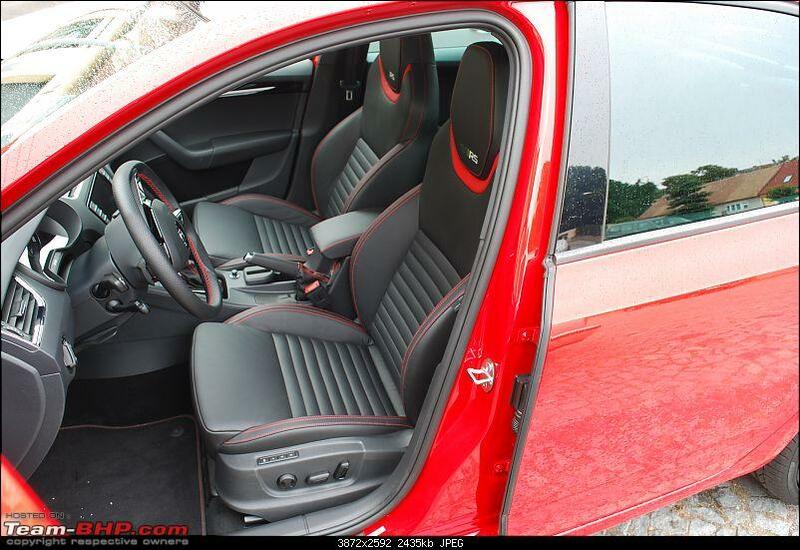 On a tangential note, the Polo GTI with 1.4TSI is making sense now. 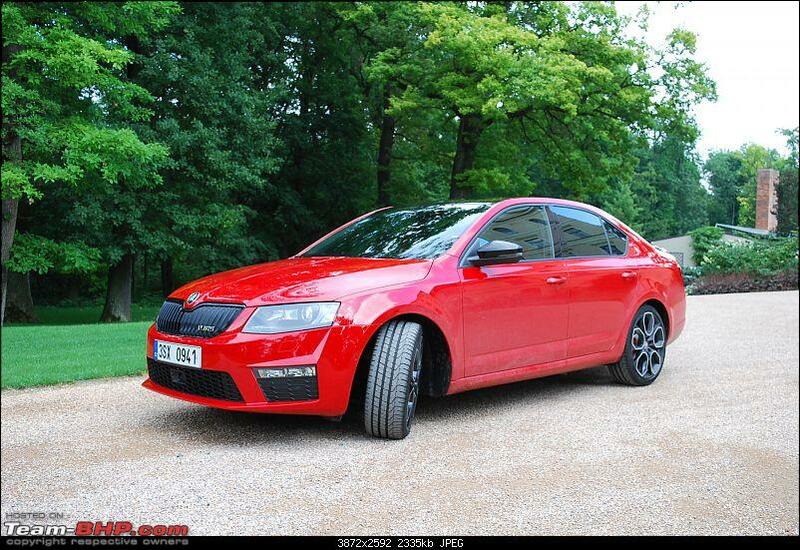 The vRS is a fast family car. It does roll slightly while cornering hard. Anything stiffer would make the ride uncompromising. I think here you meant 'compromising' and not uncompromising. Last edited by Zappo : 5th August 2016 at 18:27. Reason: Typos corrected. Please run a spellcheck (many browsers have this in-built) before you post. Fantastic review and great to see team-bhp invited to pre-launch events which shows the respect team-bhp has started to command and also shows that Skoda is trying to up their game around here. 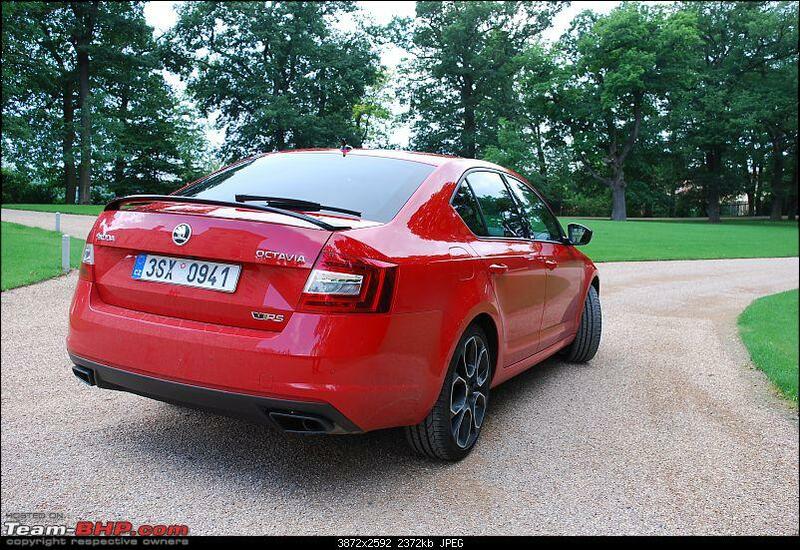 Coupled with a recent report I read that Skoda would be investing Rs. 100 cr in improving Service and after Sales, we can be rest assured there are better things ahead from Skoda. 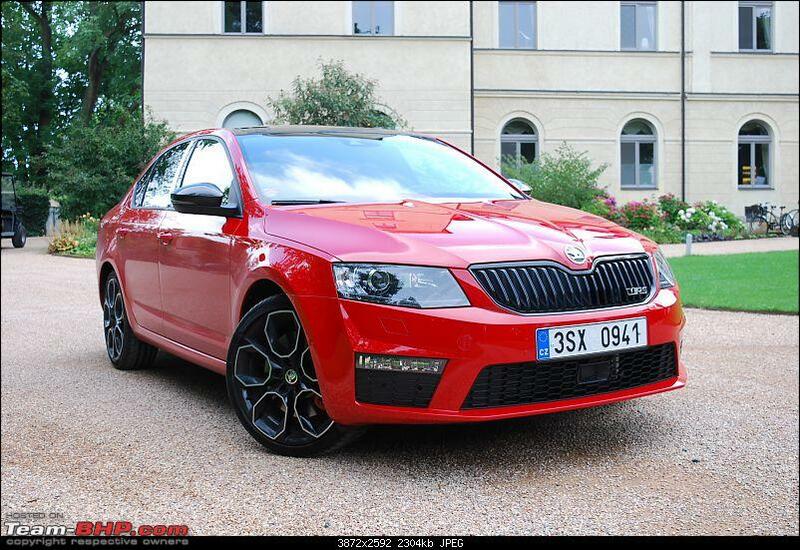 I own a 2012 Laura TSI and I am itching for another car - the Octavia vRS comes the closest to what I would want and that's saying a lot! If that is the case, would that mean cars like Octavia, Superb, A3, Q3, A4, A6 - all will have their current 1.8TSI motors replaced with the 2.0TSI engines? Unfortunately, the 1.4L is the more mainstream engine. 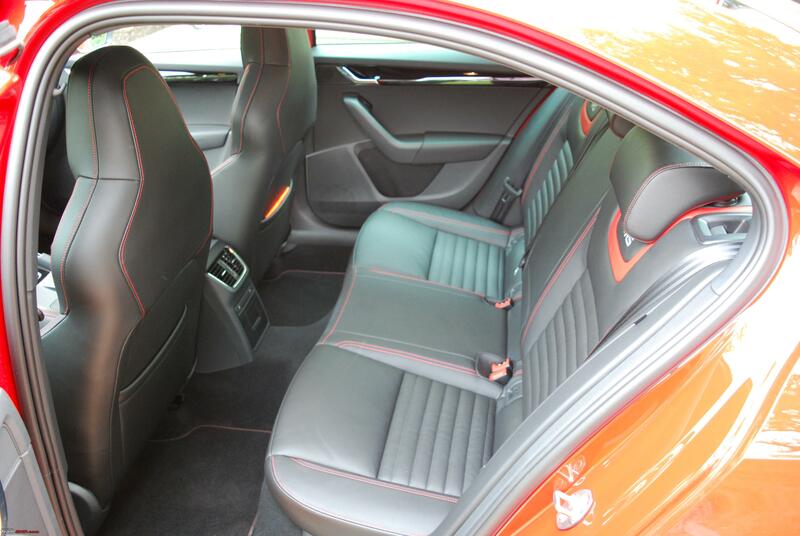 Even the premium Audi A4 is coming with this small 1.4L, not 2.0L. Takes a (relatively) yawn-inducing 9 seconds for the 0 - 100 - link. Fantastic review and great to see team-bhp invited to pre-launch events ! Even I was quite excited at being part of an exclusive crowd. We had teams from UK, Russia and the Netherlands, a total of 20 people. Very professional, it was like entering a movie hall. Media equipment politely relieved off you. 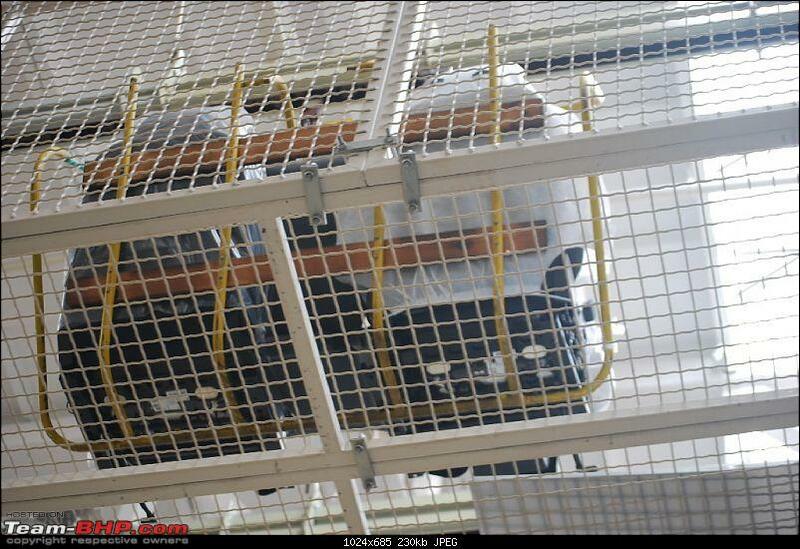 Entering an access controlled door, Approximately 10 islands composing of 4 chairs each awaited us. One corner served tea and later lunch. 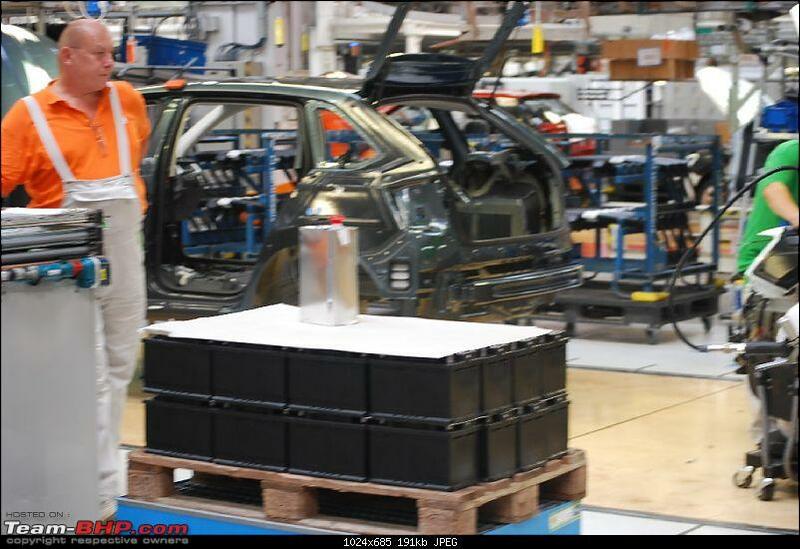 The covered car was mounted on a turntable and revealed during the presentation. The senior project managers presented and could answer whatever we asked. It was as if they had the entire vehicle data embedded in their brain. They were pretty proud of the car. They spent more time mingling with us and engaging in conversation as opposed to sitting on the side waiting to be approached. If you dial down the bling in those artist impressions, you are nearly there. 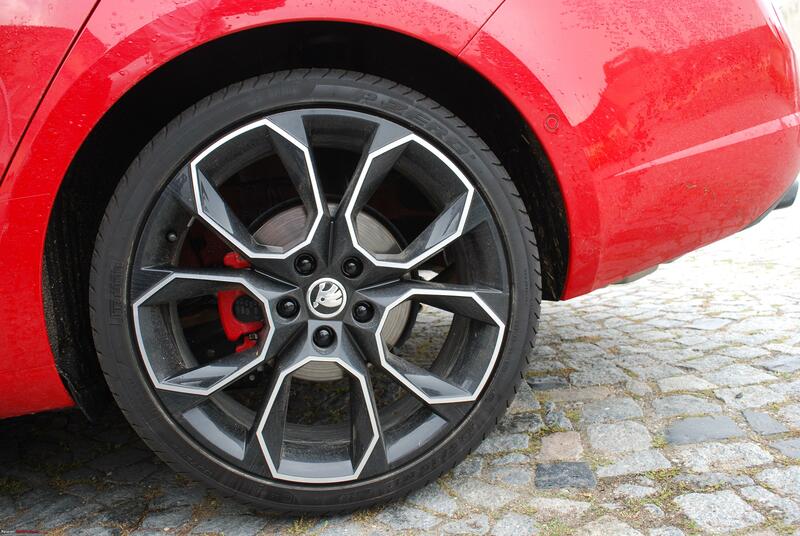 The 19" wheels look better in motion. You would have loved the Czech countryside. My IST clock saw me doing a nice early morning walk in the woods. I saw a few more Yeti's compared to in the Himalayas, starting from the one that guided my flight while taxiing in. Last edited by ajmat : 24th May 2017 at 13:35.